(1) Working with the ISPs: Work to send email that is wanted and expected by the recipients, which is the type of email that ISPs want to put into the Inbox. A. wanted – meaning you offer something of value to the recipients. B. expected – meaning your recipients remember subscribing or remember their business relationship with your brand. The ISP’s don’t have a crystal ball that tells them if the recipients wanted or expected the email, but they have something better: statistical information on how tens of thousands of their users interacted with your email – most importantly the complaint rate and the engagement rates of the email. They know what percentage of people click “this is spam,” what percentage read the message, what percentage delete without reading, and how long people read it. All of this goes into their algorithms and they infer whether your email is wanted and expected. In this world, a sender will not work to “game” the system in the technical details of how they send email, but the email will be sent in a straight-forward way. I call this working “with” the ISPs. The ISP’s goal is to deliver the email that their users want and expect to receive. If you craft your email program so that you’re sending email that is wanted/expected then everything else typically falls in line. Email delivery problems will still come up, but they can typically be solved. In this world it’s common to see 5% to 20% or higher open rates. The goal is to reach the Inbox. (2) Working against the ISPs: Using technical tricks to try to fool spam filters to accepting or delivering unwanted and unexpected email. A. A sender can examine the email program, figure out what is causing complaints or spam-trap hits, and then address that to make the email more wanted and expected. This is operating in “world one”. 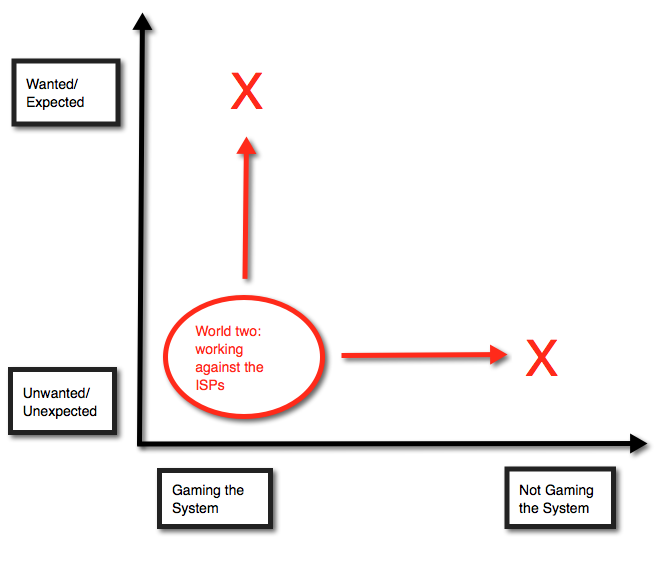 The essence of “world two” is that you’re trying to “game the system.” There is a lot of bad email deliverability advice out there, so there are a lot of people that end up going down this “game the system” path with good intentions. 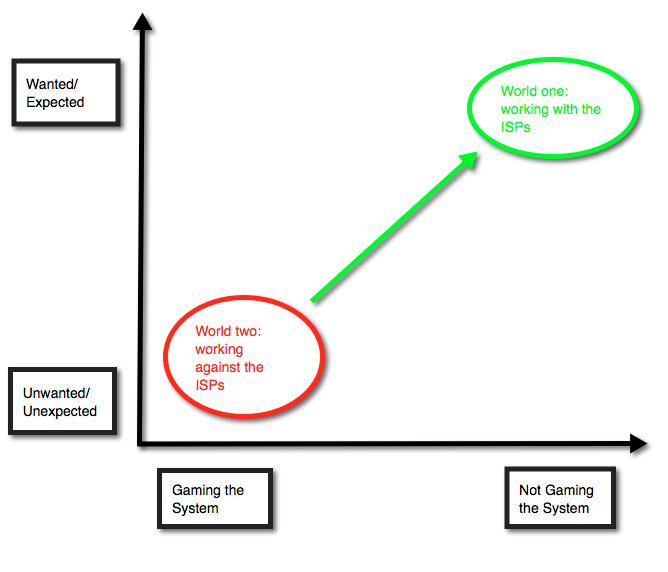 The problem of “gaming the system” is that the ISPs have dedicated teams of very smart people that are working to figure out the technical tricks that people use to avoid their filters and then block those technical tricks. All “gaming” methods eventually stop working. For example, all of the technical “tricks” listed above are well-known and the ISPs have specific countermeasures that detect these techniques and penalize them. In this world, it’s common to see things like 0.1% open ratios. And it’s common to see the “solution” to a low open ratio to be “just send more email.” It’s often that the goal, in this world, is to simply reach the Bulk folder instead of the Inbox. One of the key differences between these two worlds is whether the email is wanted and expected. People need to invite you to send them email. Otherwise your email isn’t wanted because the recipient never asked for it. If someone signs up to get a “daily deal” and you send them a daily advertisement that does not contain a “deal” – that’s not what they wanted or expected they would get. If someone signs up, and you never say anything about the frequency you will email, but you send people five messages a day – because you’re sending more mail than people expect and probably want you’ll have a problem. Unless you know that your recipients really do want that much email. It’s best to set the subscriber’s expectation of frequency in the sign-up process. If you have the “permission” to email someone buried in your terms and conditions (which are not read), then when your email shows up, it’s not going to be expected. Similarly, a pre-checked checkbox leads to recipients getting unexpected email, because not everyone sees the checkbox. Sometimes we see someone with a great subscription process, but the email that they send does not contain any of the brands that the user subscribed to. If the user wants and expects email from your brand and your email does not contain that brand, then the user will probably treat it as unwanted and unexpected email when they receive email from a brand they don’t recognize. One powerful method to making email more wanted is to stop sending to subscribers that haven’t opened or clicked on email messages after a period of time. Stopping sending to these people makes your email volume, on the whole, more wanted, because your list will contain a higher proportion of subscribers that read and want your emails. The ISPs stated objective is to filter and block email that is unwanted and unexpected. Spreading mail over too many IP addresses looks like a spamming technique called “snowshoeing.” Snowshoeing spreads a volume of mail over a lot of different IP addresses with the idea that each IP address can fly “under the radar” and avoid scrutiny by having only a very small volume on each IP address. The problem with this is that the ISPs are aware of this technique and penalize senders when they see mail coming from too many IP addresses relative to the volume. We recommend that each IP address should not send less than 20,000 messages per day. It’s possible to snowshoe using domain names instead of IP addresses. Spammers will use lots of “disposable” domain names to try to avoid a bad email reputation and hide their identity. Just performing IP snowshoeing and domain snowshoeing can be enough to cause your email to be demoted to the Spam folder at many ISPs. ISPs have filters specifically designed to detect snowshoeing. IP and domain snowshoeing is sometimes effective in helping senders reach the Spam folder. Snowshoeing sometimes allows some email to go into the Spam folder that would otherwise be outright rejected/bounced by ISPs. Each of these dimensions is a continuum, not a binary thing. The goal is to move up (more wanted/expected) and to the right (not gaming the system). If you move only up (meaning you send wanted/expected email using technical techniques designed to game the system) then you’ll get filtered because of the gaming the system techniques. If you move only to the right (meaning you send unwanted/unexpected email in a way that is not gaming the system), then you’ll get filtered because the email is unwanted/unexpected. Sometimes moving this way will cause email that was going to the Spam folder to start getting completely rejected. Often moving up the wanted/expected axis involves sending less email. The strange thing is that it’s possible to make more money by sending less email. We’ve seen this happen time and time again where sending less email allowed a sender to start reaching the Inbox which allowed them to make more money. The math works something like this. These are hypothetical numbers and a simplified example to illustrate the point. The open rate for email delivered to the Spam folder is 0.3%. This is because 95% of recipients never even see the message in their Spam folder. Assume that each open has the same chance of taking the desired (money-producing) action. Improving the wanted/expected dimension of the email requires making changes to the email program that cause sending 5x less email, and these changes allow the email to reach the Inbox. Amount of email sent is reduced by a factor of 5. Revenue per email sent is increased by a factor of 30. Total revenue goes up by a factor of 6. In doing deliverability consulting, at GreenArrow we are happy to help you dig into your email program to improve both dimensions. Improving your location on the wanted/expected axis often requires a thorough review of your email program. We can work with you to make changes through a data-driven approach, where we monitor the changes to complaint rates and engagement. It’s the ISPs that decide if they will put your mail into the Inbox or the Spam folder, or not accept your mail at all. Our recommendations will be specifically designed for you to help you maximize your email deliverability by helping you send email that the ISPs want to put in the Inbox. It’s up to you to decide if you’re willing to take these actions. Deliverability enhancement is also an iterative process. Once we have some sending history we will have some more data and may have more advice to offer.